There are certain things I love about the friendly neighborhood where I live. First, I suppose is the city-sponsored senior center with its multitude of opportunities for oldsters. 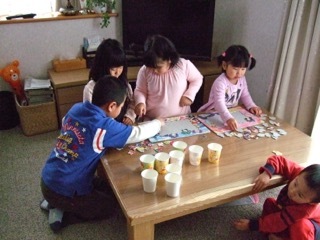 There are exercise and dance classes, a small kitchen and socializing lounge, shogi boards and a library. But best of all for me is the large spa-bath that welcomes all city residents over 65. 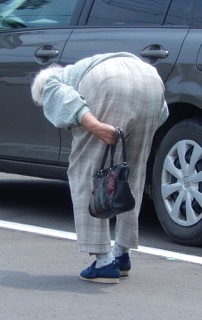 I go there several times a week and enjoy being with older women of all shapes, sizes, and physical conditions. And then there is the crumpled old lady lumbering along with her ancient vegetable cart. She appears every now and then, going door to door to sell fresh produce from her nearby farm. To balance that, right down the street from my home is a marvelous city-offered play center for kids. It has a long building full of puzzles and wooden toys, and a stupendously large yard of trees and mud and sand. The children love it. 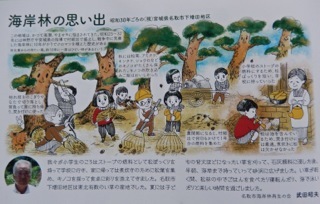 Usually Japanese are excessively fastidious about cleanliness, but here it is permissible – and expected – to dig holes and build forts, construct sand castles or huge jumping mounds. There are slides and swings, flip poles and places for skipping rope or playing tag. No one has a cell phone or wears earplugs. It all about being alive and connected – to the earth, to each other, to creativity, and to joy. Right next to my apartment is a small family-run mental hospital. It is renown for its kindness to patients and support for family members. Sometimes nurses take a line of patients out for a morning walk. We local residents step aside graciously, making way for this delightful blend of human possibility. I love the young ones who live close by. They play ball in the parking lot, ride bikes in circles or back and forth, or scurry off to after school activities. 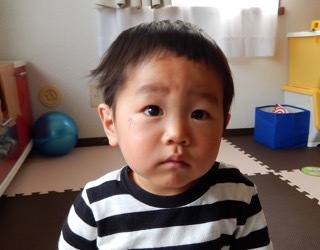 And upstairs is 2-year old Kazuki. He is loud and naughty, confident and radiant with life. I got to hold him when he came home for the first time. And since then, he has been the special light of my days. Recently I met a man who had volunteered with an NPO in Myanmar. He worked with the poorest of the poor. And yet, when the March 2011 earthquake devastated Northeast Japan, those humble souls gathered all they could spare and offered it to him, saying, “Your people need this. 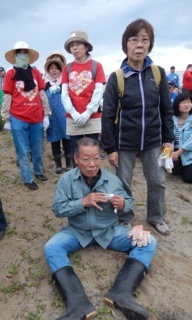 Please send it to them.” The Japanese man was so touched, so humbled, he cried. And does so even now in the telling, over six years later. The way life operates in parallels always fascinates me. One big simultaneous happening of life and death, joy and sorrow, growth and decline. Metgala in New York, famine in Yemen. All at the same time. Like so many, I acutely watch and wonder the news these days. Super powers vying for control, some subtly and long term, others ostentatiously and immediate. Xi here, Putin there, Trump all over the place. I see people suffer, others rejoice. Dance and horror going hand-in-hand. Sometimes in order to survive it seems it is essential to simply surrender to transparency and to beauty. So as the world fights and rages, here in little Sendai we dance and rebuild. 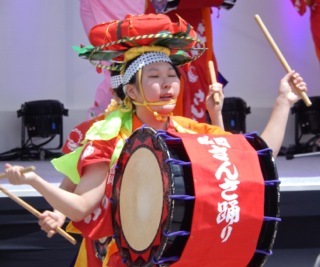 Rejoicing in the Aoba Festival with its floats, flutes, and drums. Reforesting with OISCA in its commitment, concern, and care. In the long run, won’t millions of small endeavors like these hold in check the monstrous forces of insanity obsessing the world today? We must hope. Parallel worlds are becoming so intertwined they become hardly distinguishable. Yet, without horrors, how could we ever expect to approach the depth of Light? 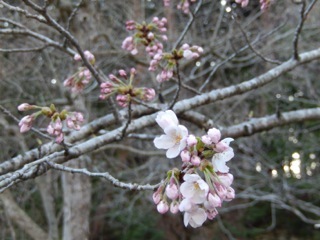 This weekend the Sakura in Tohoku are in full glorious bloom. 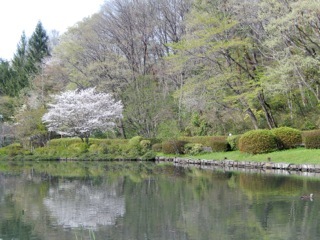 In Sendai City almost every park, schoolyard, and riverbed is swept with the gracious delicacy of a Japanese spring. It is truly euphoric. Last year I focused on the flowers themselves. Their suggestion of other dimensions, of ethereal realities goes far beyond words, to the realm of pure feeling. This year, however, my eye moved more to the people enjoying a day together, welcoming the joys of this hopeful season. Their delight was in pure contrast to international news, which has absorbed much of my attention in recent months. There are so many worries and questions today. How can anyone applaud an escalation of war as a way to “mean business” and to solve very complex problems? How can people believe the intricately woven stories that divert us from the truth of human dignity, especially of those suffering the most? The United Airline disaster is yet another example of “might as right”, but this time, thankfully, gone terribly wrong. Can we believe the apologies of CEO Oscar Munoz? Are they genuinely sincere, and not motivate by economic concerns alone? It seems to me that if Mr. Munoz really wanted to express a change of attitude and values, he would do more than apologize and reimburse passengers the cost of that infamous flight. Has it occurred to him to use a percentage of his enormous salary (14 million dollars in 2016) and all of his bonus money over the years (He may receive yet another $500,000 soon) on an ongoing basis to contribute to organizations that work with victims of police brutality, domestic violence, and child abuse? Has he thought of including United Airlines, Inc. as part of that contribution to the betterment of society? As I watched ordinary people today together celebrating the return of new life, I realized how truly beautiful our humanity is. And hopefully, the disturbing descent of our values to the lowest common denominator will find reason to change direction, moving us upward to embrace something both new and as old as the universe itself. Spring, the promise of new life for everyone, not just those at the top. The world has moved on from March 11, 2011: the era of The Great East Japan Earthquake and Tsunami. In fact, that time is a distant memory as the world plunges deeper and deeper into wars, chaos, uncertainties, and distrust. And sadly, each day the news is increasingly filled with more and deeper heart-stopping events. So have we really moved forward? What about other dimensions of human expression? How has the world progressed on the level of the heart? Can we honestly say we are making efforts to mature these traits in today’s complicated and confused world? Surely in many small ways we try. 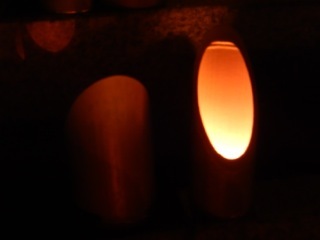 Today March 11, we blessed our memories and our lives with deep reflection. that is fundamental to our humanity, and to the ground of our being. The future of our world. 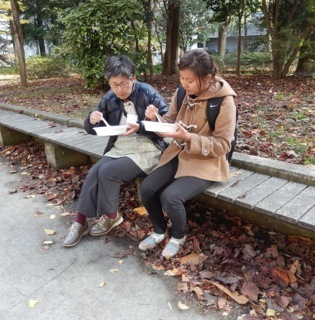 Imai Sensei and Aoki Sensei do so much more than feed the homeless. They give them showers and wash their clothes. They help find jobs and inexpensive apartments. They schedule sessions with lawyers for legal advice – about their individual rights and how best to adhere to city laws. They also arrange for medical care, including eye exams and glasses. Likewise, they offer donated clothes and food packets as parting gifts each time the homeless assemble for a warm, nutritious meal. Yomawari, Imai Sensei and Aoki Sensei’s group, have rules, but enforce them lovingly. They refuse any form of drunkenness. The other day one man arrived reeling from alcohol, stinking from not bathing, clothes torn, and socks so damaged that a web of filthy cracks and splinters peeked through the heels. This guest swayed in, shouting jokes, causing a huge uproar. 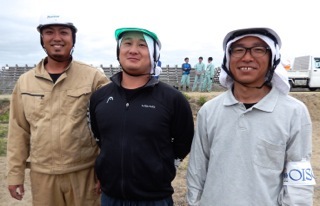 Volunteers smiled and laughed politely at his antics, but Imai Sensei was not amused. He told the noisy, smelly man to leave immediately. Sternly, yes. But also lovingly. A ban, yes. But also fairness and an open door. I gaze at an apartment near this park, and wish it were home. Living overseas as an American these days is extremely interesting. It is also unsettling, confusing, and challenging. Many friends ask me what is going on it my country. They want reassurance and hope. I am never quite sure what to say. But I talk about the resistance to Trump, happily gaining momentum daily. I try to reassure them that America knows the importance of a good relationship with Japan. Even so, people are very uneasy. Yet being thoughtfully Japanese, they think of my feelings, too. And so, they give me reassurance — mostly because they themselves are seeking it. And after Trump’s election, a friend wrote to me. I wish USA would be greater than ever. And the Great USA would help other Countries like Mexico or Japan. I think “GREAT” means SOFT, KIND, THOGHTFUL, CALM, and WARM ! ! ! It does not mean “A LOT OF MONY”, I am sure. Mr. Trump could change America better than ever. I have heard that “Me first” is the worst politeness. But half of the number in USA chose “America first”. I think many people would find out soon that “Together” would be better than “America first”. I wish he would be good person . . .
Let’s try we can do. Like my friend, I hope for the seemingly impossible. Not necessarily expecting Trump himself to change. But realizing people together can indeed bring a “softer, kinder, more thoughtful, calmer and warmer world”. Even as we resist, let’s try. I think we can do. In Japan the New Year ends on January 14th. 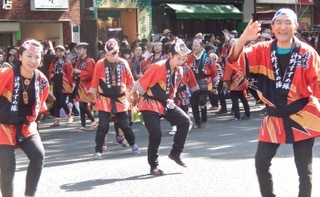 That day is called Dontosai and is marked by fire festivals held in Shinto shrines throughout the country. It is a time of purification and of forgiveness, of a readiness to start the New Year with humility and resolve. Fire burns away the past. It cleanses minds and hearts to create a vision of hope, a promise for what lies ahead. 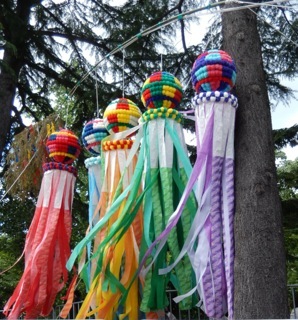 On that sacred day people gather their decorations and flock to the nearest Shinto shrine. 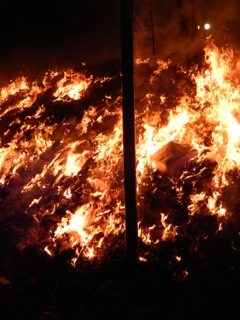 There they toss their offerings into bonfires that roar and hiss as the flames are fed into full abundance. What makes this festival unique is not so much the bonfires, however, as the people. 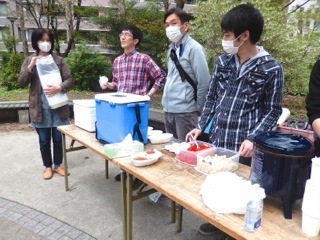 Participants join colleagues, dressed in thin cotton outfits and straw sandals. They walk together through the city ringing bells and shivering their way to the nearest shrine. They carry lanterns and hold paper in their mouths to control their chattering teeth and to give them a focus beyond the piercing cold. Once at the shrine area, they circle the bonfires, rejoicing in the warmth, as other worshipers throw their decorations into the flames. From there they wind their way to the altar. 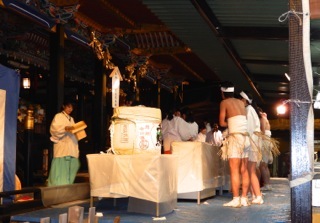 There they receive a priest’s blessing and are greeted by shrine maidens offering them sake, elixir of the gods. The hard challenge of filing through a city in below freezing temperatures, scantily clad, is a test of fortitude and a bonding experience with those who have the courage to join them. Regular worshippers, fully dressed for winter’s bitterness, also head to the altar to pray. They, too, ring bells, bow, ask for blessings. They take fortune slips, believing that this day will reveal the secrets of the year ahead. Unfavorable predictions are left behind, leaving ribbons of fluttering sadness for the gods to address, not the humans. Japanese say they are not religious, and maybe they are not. But they all recognize the power of superstitions and live by them. 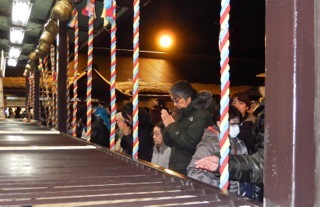 People of all ages go to shrines on Dontosai. 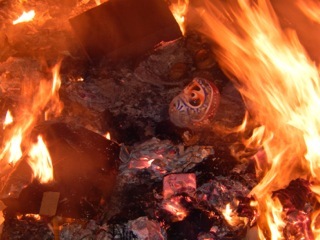 They pray, they eat, they buy expensive decorations and Daruma dolls, immediately throwing them into the fire. God bless the world as we, Japanese or not, strive for purity and humility, as we seek forgiveness and start this year with endless courage to endure. Despite the upcoming holidays, the world is bleeding deeply and tragically. A profound sense of foreboding is seeping in everywhere. It would be easy to succumb to the uncertainty of these times, even as they bring values into acute focus. 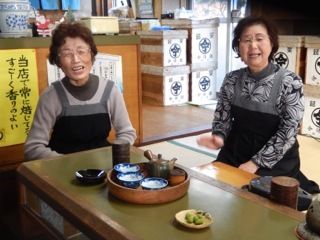 Yayoe Konno and her sister-in-law, Noriko Konno, were both born in Shizuoka, the tea growing area of Japan. 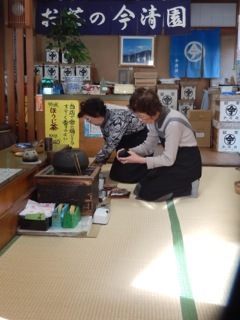 They came to Sendai as young brides and now are the only ones left honoring the shop’s old ways. Then out comes a delicate presentation of sweets and the gracious, perfectly orchestrated making of tea. It is indeed a ceremony. Or maybe better a ritual. An ancient and sacred one. I savor the vivid green bitterness, and my soul is indeed soothed. Tea’s continuity through war and peace, through poverty and riches, through hard times and prosperity holds a profound reassurance. We are making dangerously ignorant choices at the moment. But as we “little people’ join together and work relentlessly for freedom of thought and expression, there is surely hope for a better tomorrow. Recently I had the pleasure of reading an article in The Catholic Worker about one of its Hospitality Houses, St. Joseph’s. It was written by a volunteer, Megan Townsend, who regularly goes there to serve and to socialize with the many others who grace St. Joe’s with their unique and important presence. 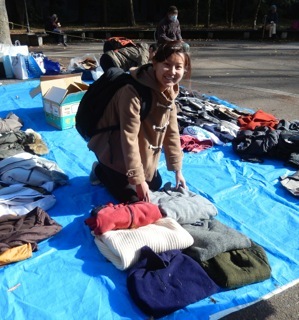 The more I read this short, but profound article, the more I realized it reflected much of what Imai Sensei’s Yomawari does for the homeless here in Sendai. Let me quote a few excerpts to illustrate what I mean. “As I volunteered more often and got to know this … interdependent community, it felt a lot less like service and a lot more like sharing . . . As I watched people on the house at St. Joe’s greeting people . . . I observed this casual ease of giving. “. . . I admired the way they would act as if giving away whatever they could was just something they should do. It is natural . . . I would watch volunteers at St. Joe’s ask someone their name, shake their hand, and then joke with them as if they had known each other for years (which in some cases they have!) . . . Asking someone their name is just the beginning of the relationship, an invitation to community. 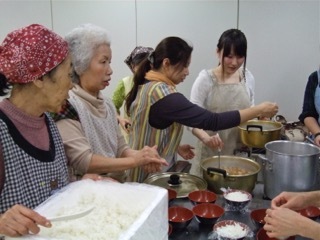 Last week I had the privilege of taking two students to volunteer at Imai Sensei’s soup run. One had been before, and since the experience impressed her so deeply, she asked a friend to join her. It was lovely watching them interacting with the men and women, both volunteers and guests. They treated all the people there with great kindness and respect, just as they themselves were treated. It always means a lot to feel the truly loving, caring community that Yomawari has created and maintains. All are always welcome. And everyone leaves feeling full – not only of warm food, but also of the greatest of gift of all: support and unconditional love. Every morning when I greet the dawn, I wish that I were by the sea. As I watch light slowly unfolding the day, I can easily sense the ceaseless rhythm and energy that only waves, tides, and the vast expanses of sky can bring. Today after my morning ritual, I went inside and listened to the news. I learned of the well-planned offensive to recapture Mosul from ISIS’s relentless strangle and grasp. I thought of the ensuing, bloody tug of wars, ferocious between all sides. Each has strong beliefs and accepts that death is a necessary part of change. The more it dawned on me what lay ahead for Mosul, for all concerned, the more I felt the literal pull of the sea. The coast is easy to get to from Sendai and does not take long. So, I heeded my intuition and went. I passed newly built homes, sadly with no grass, no trees, no gardens. 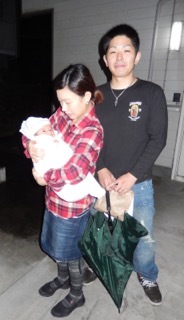 I wondered what sort of mental and emotional world we have been creating since Tohoku’s life-altering events of 2011. Where is the famed Japanese connection to nature and to land? 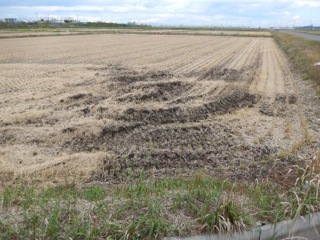 But thankfully, further on we passed newly harvested rice paddies and barns filled with tools to work our precious earth. 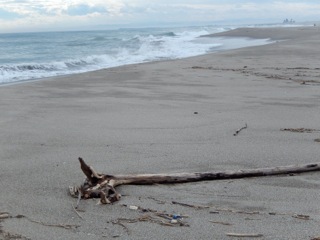 Arahama, the shore area, had not changed much since last March when I went there to pray for the soul of the dead. Huge trucks still lumber by, explanatory bulletin boards dot construction sites, and the tsunami-damaged school is still standing, and will continue to do so as a memorial to what people lost or left behind. The frames of houses with recent altars, the temporary Buddhist temple with a priest droning prayers inside, and the erect Mother Buddha with the nearby Shinto tori gate are all as I remembered them. Pulled by the cyclical call of the tides, I worked my way to the beach. Once there I thought about Nature and death, of war and death. I pondered whether at this stage in humanity’s eternal evolution we need to fight, to have a life-threatening challenge to pull us decisively away from noise and glut and even wisely given counsel, so as to discover our own unique voice and the ground of who we are. Are we yet consciously our core? The waves rolled and I felt the eternal dance of earth with moon. I watched the resultant tides, smooth today, but always harboring the possibility of turbulence and destruction within. I also deeply felt the horror of misplaced idealism, coupled with tribal wars: Mosul today, the world past and tomorrow. The water washed my feet and evoked humble prayer. May innocents survive and grow in grace. May rebuilding be selfless and generous. May we think first of others, those here and yet to come, as we work for a future without fear. Conflict and destruction are innate in all expressions of existence. But equally so, maybe more so, are harmony and efforts to transform the past and shape a world that is fair and honors all. War is something that I cannot get my mind around. It is completely incomprehensible to me. But precisely because wars are so prevalent today, I feel an urgency to try and understand why people resort to violence to solve their controversies. And coupled with that questioning is the universal tendency to highly revere soldiers who die in combat, no matter how alarming or questionable the conflict may have been. This effort to understand is not to condone war, not at all. It is rather a desire to get a glimpse into the psychology behind that unfortunate choice of behavior. 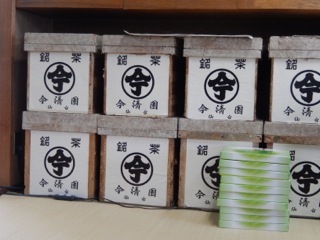 Recently a friend of mine gave me the incentive to visit Yasukuni Shrine. 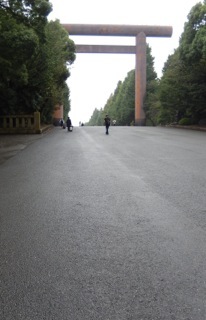 Since the Meiji Restoration over 100 years ago, Japanese who fought and died for the Emperor are buried there. (1) And because they gave their lives for their country, they are considered “Kami”, or gods. But the place is not as pure as it might seem. Some of those interred are rather questionable characters. (2) I have read so much about the negativity and controversy of the place that I was uneasy going. But I also was determined to go with an open heart. Yasukuni Jingu is indeed a very beautiful place. The enormous entrance torii gate, the sensual wooden doors adorned with a golden chrysanthemum flower, moss-covered Sakura trees, and the dark-hued main shrine all evoke an essence that is indeed sacred and profound. I wandered slowly and found monuments in honor of all those who sacrificed in war: from combat horses to mothers and wives grieving their slain loved ones. The sincerity and devotion of worshippers struck a deep cord, as one after another bowed, clapped twice, prayed, and bowed again. There was a sense of being absolved, of purifying one’s inner and outer being in order to move out into the world with greater clarity and purpose. The energy at Yasukuni Jingu was intense, but subtle. Even though the shrine is relatively new, the long stretch of history could be felt everywhere, rising from the rich black earth of the complex itself. The accompanying museum depicted this land’s wars for literally 1000s of years as it struggled with shifting identities and changes in power. Earlier eras seemed to express the “Art of War” with magnificent armor and breathtaking swords made by master craftsmen. As history worked its way closer to the 20th century, however, the horrors of conflict became more apparent and relentless. What touched me most deeply in recent wars was a replica Kamikaze airplane. It was suspended graciously from the ceiling, a delicate Sakura blossom on the tip, a round red sun behind. I could sense the vulnerability and resolved determination of those highly intelligent, acutely aware young men, consciously flying to their deaths. I thought of today’s terrorists and wondered what contrasts and parallels will be found as research opens up some of the unanswered complexities of past and current wars stemming from people’s troubling beliefs and actions. Yasukuni Jingu is indeed a very meaningful Japanese memorial. 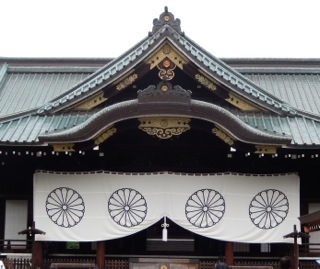 But as my other Japanese friends have pointed out, it is incorrect to equate Yasukuni Shrine with the Budou Spirit. The Japanese Mind and the Budou Spirit are different, even though they may overlap. 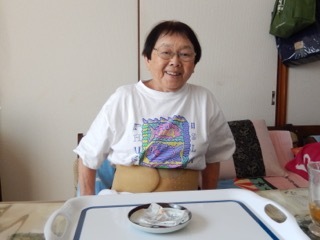 In my visit, I came to realize that the Budou Mind is not exclusive to one culture or nation, as proud as many Japanese are of it. Of course, it requires a certain sensitivity and the correct attitude, proper training and ongoing discipline. But in essence the Budou Spirit is not about outer wars fought by one nation. Rather it entails the ongoing struggle of self striving to master one’s own ego, seeking an inner ideal. 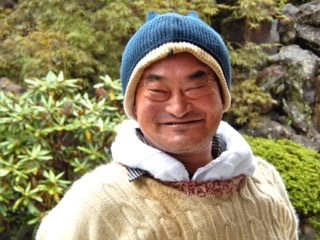 And being a dimension of Mind, the Budou Spirit is open to all. And as such it is World Heritage. 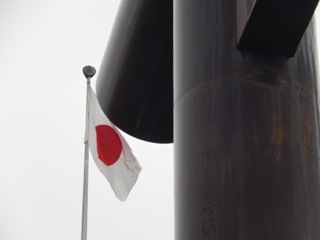 (1) Even though the friend who told me about his meaningful visit to Yasukuni Shrine equating it with the Budou Mind, other Japanese friends challenged that belief. 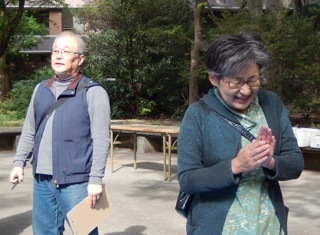 They pointed out that the Budou Mind existed long before Yasukuni Shrine was built. And in fact, its purpose was in direct contrast to it. 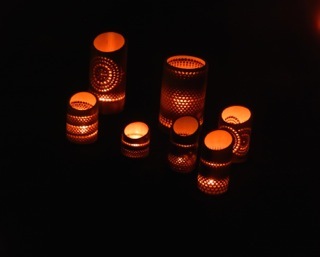 The Budou Mind has been used for centuries for physical, mental, and spiritual training. The Boshin War ended the rule of the Shogunate, ushering in the Meiji Era in 1868. At that time Japan wanted to reestablish the Emperor system and become more like the West. 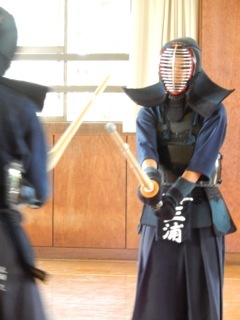 She wanted to do away with traditional, “outdated” forms of military and mental preparedness that the Budou training represented. Therefore, the fine art of Budou was downplayed in order for Japan to become more “forward thinking” and to “catch up” with Western powers. More specifically, Yasukuni Shrine is devoted to Japanese who fought and died for the Empire of Japan, which existed from 1868 to 1947. That is, from the reestablishment of the Emperor system in the Meiji Era through the Taishou and part of the Showa Periods. 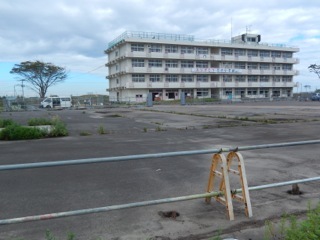 Other buildings in that complex honor non-Japanese who served Japan. 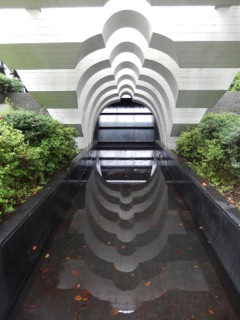 And yet another building commemorates all those who died in WWII, no matter their nationality. There is also a museum that depicts the history of conflicts in this archipelago for over 2300 years. By equating Yasukuni Jingu with the Budou Mind, my friend has blended Budou with Japanese nationalism. However, they are actually very distinct, even directly opposed to one another. 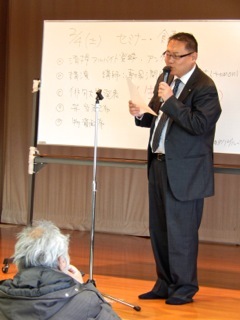 In fact, in today’s Japan, religion and politics are separate. 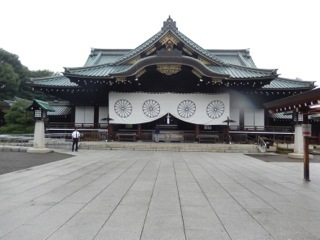 No Japanese Emperor has ever visited Yasukuni Shrine since WWII, although several Prime Ministers have. (2) In my last letter, I referred to these men as “Class-A war criminals”. From an international perspective, that assessment is correct because of a post WWII court’s decision. However, in response to my letter, one Japanese friend said the following. Before reading his thoughts, however, It should be remembered that in Japan, as in most Asian countries, shame, not guilt, is of prime importance in regard to one’s self esteem. Class A war criminals don’t exist in Japan. In 1952, over 40 million’s signatures were gathered by Japanese people in order to acquit A, B and C class war criminals. The number of signatures were about half of the population at the time. Then the Japanese government decided that they weren’t criminals anymore at least in Japan. Although it doesn’t mean Asian neighbors think the same way and the Tokyo Trial is overturned, it is no doubt about the half of Japanese at that time forgave them. I personally think the militaristic government are responsible for the war as a top, but I want to value the decision by the Japanese people.
. . . some might think that kind of opinions would be far right-wise. But as you may know, I just love my country. 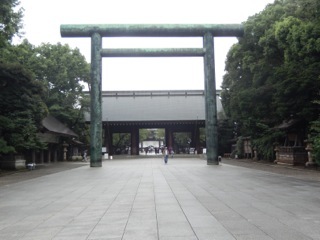 Yasukuni Shrine is extremely controversial. It is a Shinto Shrine that was built to commemorate Japanese war dead. Every country honors its fallen soldiers. So in that way Yasukuni Shrine is not unique. But what makes it questionable is that WWII convicted Class-A war criminals, performing crimes against humanity, are also interred there. And in the past few years, several Prime Ministers have gone to pay their respects to fallen heroes, not distinguishing between those who served the country honorably and those who abominably abused their positions of power. (1) Understandably, countries neighboring Japan are furious by the overt display of nationalism that these visits by Prime Ministers seem to suggest. I personally detest war. Of course, I recognize any body’s need for an immune system, and a country’s obligation to protect itself. So, I understand the necessity of a military, even though I would love a world where the armed forces were obsolete: a world mature enough to dialogue solutions to conflict, and willing to work for the whole of humankind, not narrowly focused on national self interests. But that is wishful thinking, and I know it. The other day a friend, a man who has practiced Kendo for years, told me of his recent visit to Yakukuni Shrine. “Why did you go there?” I queried in disbelief. “Yes, Budou, ‘martial arts’, as you say in English. But that is not a good translation. It only touches the surface. The Budou Mind covers so much more, is so much deeper. It entails every ounce of our being, our keen focus, our complete Heart, our total Mind. He went on to say, “We are this from before we were conceived. It is our soul. It is all around us. 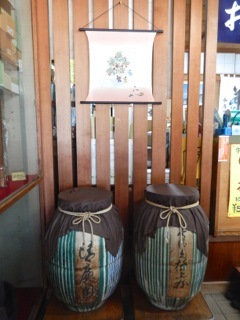 It is part of our traditional culture. It is how our society operates. “But . 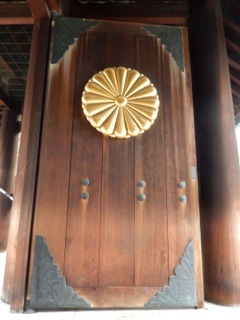 . . but what does this have to do with your need to go to Yasukuni Shrine?” I asked, still uncertain. I thought about what my friend said, but was still very uncertain. I realized that my attitude was strongly influenced by what I had read of Japan in WWII. One small aspect of that complex and controversial issue was the plight of Kamikaze pilots. The militaristic government had taken the cream of what Japan had to offer — the best educated, the most cultured, the most intelligent young men — and had forced them to commit suicide for its own distorted purposes of nationalism, ego, and power. It covered over this vile abuse of the Budou Spirit by comparing those young men to the gracious, ephemeral beauty of cherry blossoms. How can Yasukuni Jingu be a spiritual place if such poisonous energy is an integral part of it? Still very uncomfortable, but trying to understand, I asked my friend his thoughts on that highly significant question. “Anne, Anne,” he said to me, “the men at the top of the military government during WWII were the epitome of evil. Their sick minds and actions caused tremendous suffering. There is no doubt about that. But you have to look deeper. If you go down to the very foundation of life itself, you do not find evil. You find purity. You find goodness. You find an openness that can only express the essence of God, manifested in the very soul of humanity. My friend’s words fascinated me. And because I always wish to test my own beliefs, I have decided to go to Yasukuni Jingu and see for myself what the place has to offer. What kind of energy will I find there? Will I sense the depth of Mind that my friend attunes to so deeply? Will I be equally as moved? I do not know. But I do know that I will go there with an open heart, not allowing previous ideas to contaminate whatever I should encounter there. 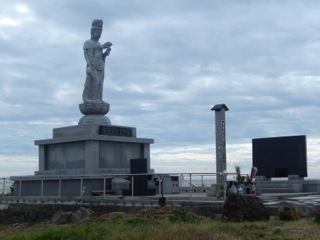 (1) For Japanese anyone who died for the country immediately becomes a “Kami”, or a god. In fact, according to Japanese Buddhism, when we die, we shed our human element, and become pure, divine essence. Every year in mid-summer when rice paddies are poignantly green and fields are joyous with produce, three very special days, called Obon, are set aside for worship and for prayer. During that period, ancestors make a sacred and special pilgrimage to this earth’s dimension. They long to commune, to bless, and to be with those they left behind. 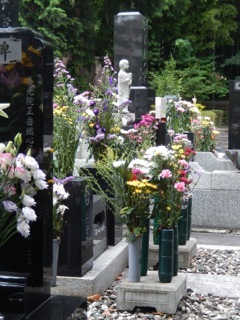 In return, the living flock to graves, adorning them with flowers, incense, sake, and prayer. Cities vacate as people return to hometowns, to the beloved land that holds generations of family devotion, duty, and bonds. 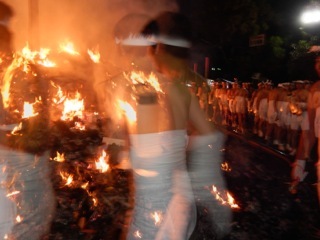 At night in particular the souls of the deceased come alive, haunting graveyards and temples. 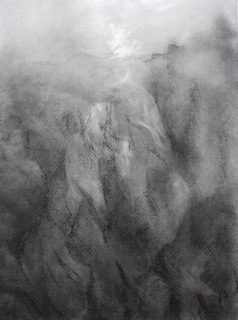 They are seeking loved ones, hovering close, eager to give needed assistance and care. Those on earth respond with pathways of light to guide souls to their open hearts and fathomless wells of eternal love. 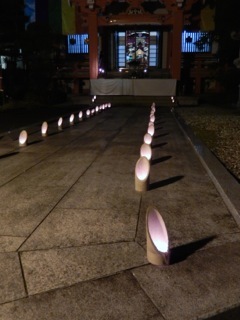 Obon is indeed a time of humility and reflection. Those sacred days offer a bridge between the wisdom of heaven and life’s eternal quest for the divine. 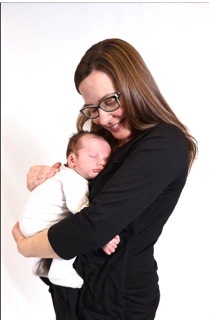 One university where I teach is for women from well-heeled families. Most of the students are intelligent and motivated, so it is a pleasure working with them. My writing classes are particularly satisfying because the students’ steady progress can so clearly be seen. So, I like to give them as much responsibility for their own learning as I can. If they are exceptionally eager and well prepared, I encourage them to do an independent research project. 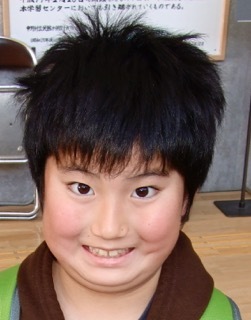 Of course, I encouraged Masaki to volunteer at Imai Sensei’s Yomawari Group. That day she helped dish up rice. And then she assisted men to select a nice shirt or trousers. “These people are so polite. My image is changing once again. I went from the idea that there were no homeless here to being rather afraid of them. But now I see they’re people just like you and me. There’s such a thin thread between having a normal life and living on the street. I am surprised to find myself admiring these people very much. Life is really hard for them. And what sort of a future do they have? But they don’t give up. And today some of the men even told jokes and got everyone laughing. The problems are very deep. And that makes us even more aware that our humanity is one. “Kizuna” — we are here to help each other. “Kizuna” in Japanese means “emotional ties”, “relationship”, “close connections”. It also implies joining and working together as a unit. People’s reaction to the recent Orlando shooting is a perfect example. And the outpouring of assistance and care, love and support, is still ongoing. Kumamoto here in Japan is another. Earthquakes, landslides, devastation, are all being met with an incredible sense of working together, of helping each other survive. 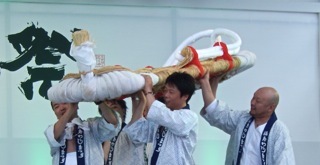 The Kizuna spirit that emerged in Tohoku in 2011 is world renown. It held us together, giving us courage to move forward, keeping us alive. And at that time, emotional support, Kizuna 絆, took many forms. One of them was to bring joy. 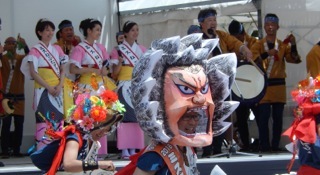 So, despite hearts vulnerable and raw, a very unique festival was born: “Rokkon Sai”, or “Six Spirits Festival” 六魂祭. 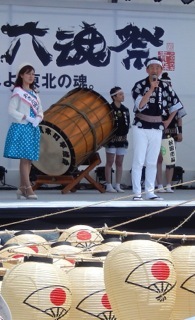 That is, the six major Tohoku summer events, one from each prefecture, joined into one. 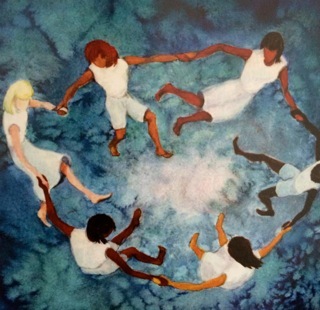 This joyous and powerful expression of Hope through Unity has been repeated every year since 2011. But this year, the sixth, marked this final combined celebration. And what a glorious grande finale it was. The hallmarks of our era. Whatever shocks and awes absorbs our greatest attention. Amid the noise, where is the promised Still Small Voice? Open our hearts to it; allow it to flood our being? But as pre-dawn sunlight awakening the day. The great unfolding of night, of sleep, of dream. The intuitive hovering of animals. Or the promise of plants. It is our eyes and hearts that need to see, to feel, to open. 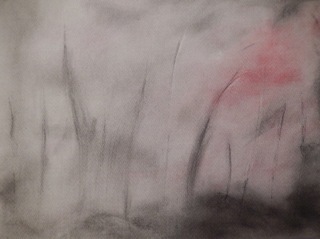 Whole forests emerging out of devastation and human toil. Rebuilding lives and hope, in the midst of today’s chaotic world. P.S. 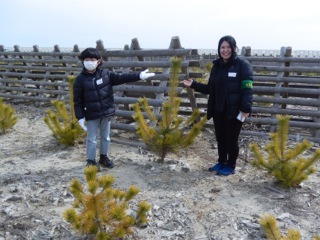 Is it by coincidence that as OISCA members planted trees on Saturday, the G7 met in Sendai to discuss the future of the world? P.P.S. Today’s volunteers came in all shapes and sizes. 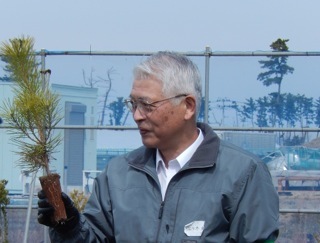 Some Japanese say they love “shinryoku”, new greens, even more than Sakura. The freshness of emerging life is uplifting and joyous. Many people celebrate by taking walks in the park or strolls along riverbeds. 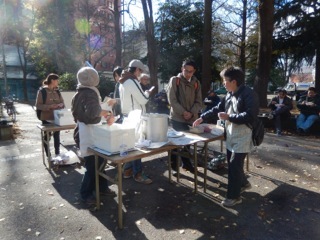 I had not been to help Imai Sensei feed the homeless for several months. But recently I had time, so decided to go. 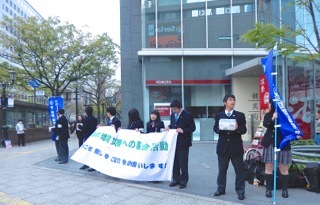 En route there I came across students asking for donations for the victims of the Kumamoto earthquake. I met the same later in several other places. Many kind souls helped us in our time of great need, and still are. So we feel a particularly deep bond with those suffering today, albeit far away. 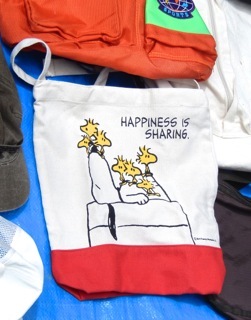 And therefore, we give, we share. And that makes us feel happy. 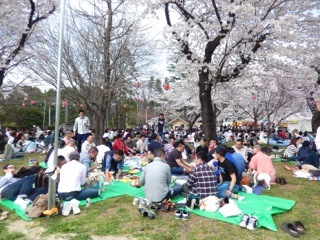 When I arrived, the park where Imai Sensei’s Yomawari NGO meets was full of kids playing ball, swinging and sliding, shouting and laughing, delighting in the freedom offered by that beautiful spring day. Gradually, like quiet birds, one homeless after another began to arrive. They sat on benches in the sun, waiting for the food truck to arrive. Yomawari volunteers are like professionals now. After years of running the program, they know just what to do. 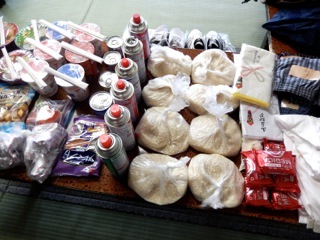 Within minutes everything – food and clothes – were ready. Recently there have been fewer partakers. That is because some now have a room, provided by either the city or NGOs. They have to pay a minimal rent, but some of these gentlemen receive social security or a pension. Others find odd jobs, like cleaning Sendai Station before dawn. 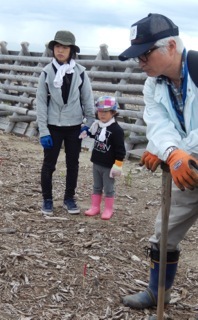 Likewise, many still go to Fukushima to help clean the nuclear plant there. 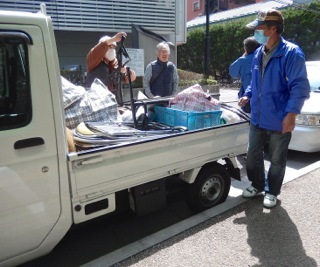 And now maybe some will find their way to the far south, to Kumamoto, to lend their efforts there. 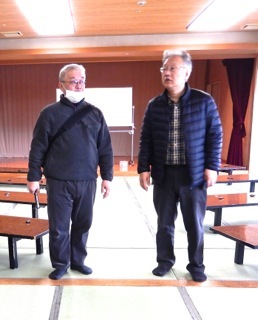 That leaves mostly old men as the ones who rely on Imai Sensei’s ongoing generosity and kindness. 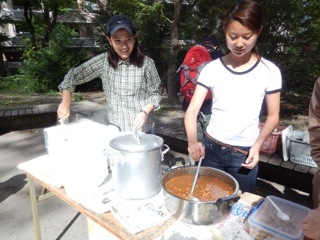 Despite the fewer numbers, often young students volunteer serving food and handing out clothing. 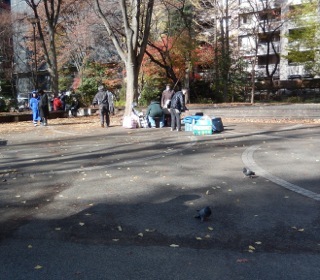 Compared to other places, Sendai’s homeless count is not particularly high, a few hundred. But that number does not include the people who while away time in internet cafés or other accepting places that never close. It also does not include those without jobs, but are lucky to have a place to live. 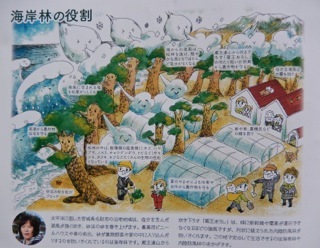 Yomawari is unique in that it provides showers and laundry several times a week. 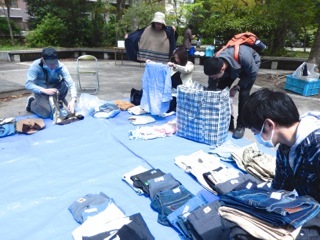 Most often the clothes are folded neatly, but returned wet. The men graciously accept them and head to parks or riverbanks, where they spread them out to dry. Several days ago there were two massive earthquakes in Kumamoto, a prefecture far to the south of where I live. Buildings tumbled, people died, and water and electricity were cut. Even now many are still housed in shelters, while aftershocks and mudslides continue to threaten both cities and towns. Rescue workers and relief efforts are in full force as the area struggles to contend with the ongoing physical, emotional, and mental devastation. Those professionals are exceedingly well trained and prepared, so locals, although shattered, know they are receiving the best assistance possible. Likewise, miraculously, as of now all tsunami warnings have been lifted. And the nearby nuclear plant, ironically in a place called Sendai, is reported to be undamaged and functioning properly. These important things provide a flicker of hope in this time of great trauma and despair. The intensity and tragedy of this situation are a definite reality of the complexity of the Japanese experience. 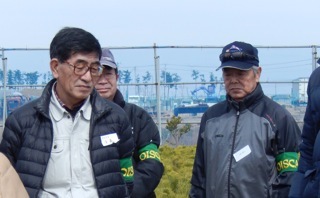 Yet even as this nightmare overwhelms people in Kyushu, and our sincere concerns, prayers, and assistance extend to them, we know and have to accept that sadness is never the full picture. Japanese innately know that whatever is true is always balanced by its opposite, which can be equally as true, and often happening at the same time. 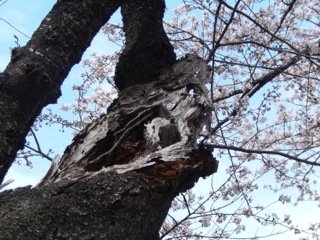 Indeed, one such counterpoint to the Kumamoto tragedy is the delicacy of Sakura, cherry blossoms. They are coming to full expression throughout the nation at this very moment. 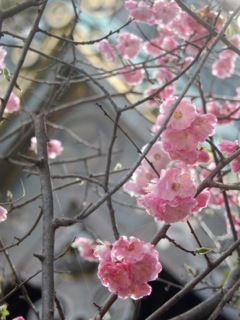 Even though Sakura seem ethereal, light, and joyous, they, too, convey a multitude of profound meanings. Throughout the centuries they have symbolized the complete cycle of life – from the joy of birth to the inevitably of death. Their delicate petals suggest the fragility and shortness of youth, and call on us to appreciate ephemeral beauty while it lasts. Yet, the thick, gnarled trunks promise us longevity, along with the necessity of obligation. These dark, twisted beings, often with only a shell remaining, have the privilege and power to support new life as it delights in its earliest expression. Yet they later work to feed the leaves in summer and protect dormant life in winter. And precisely because of this ongoing nurturance and annual recycling, the beloved Sakura shower us with the hope of rebirth and eternal life. 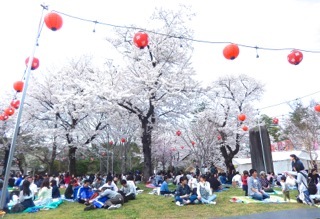 The blooming of Sakura is a cause for celebration. Starting in the south and moving northward, blossoms offer their shy message of hope and of joy. 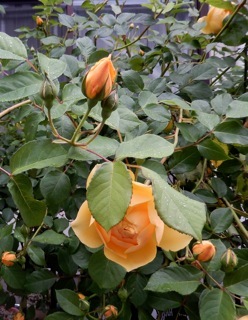 North of Sendai, Miyagi, the flowering occurs rather late. That enables the delicate cherry to brush the festivities of early May, when carp streamers announce the joyous presence of children. 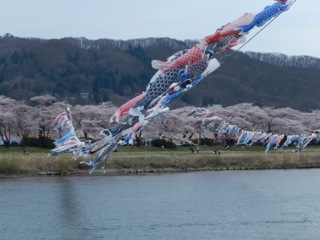 In particular, Kitakami, Iwate simultaneously adorns itself with both Sakura and streamers. They offer us the pleasure of sheer beauty, even as petals fall like snow or tears of gentle rain. Kumamoto, and the nation with it, are weeping now. Yet even as this uncertainty continues, we are taking time to appreciate beauty while it lasts, knowing that it must die, but will recycle again and again, and forever yet again. Nature and Science. Two powerful forces precariously teetering in their ongoing attempts to find balance. Hopefully, what they build outweighs what they destroy. But no guarantees. Climate change, pushing us to the edge of challenge, yet opening opportunities to shift values, to see ourselves and our creations – even our most advanced technology – as an integral part of the Nature World, the Web of Life. Nature and Science. Where do they dance in harmony? What are examples that encourage a happy marriage between these two forces calling for dynamic involvement and change? OISCA. 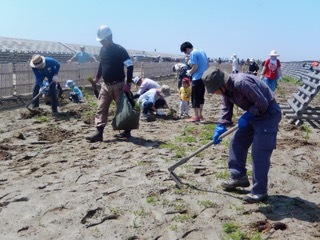 A Japanese NGO devoted to planting trees. Worldwide. And also very close. 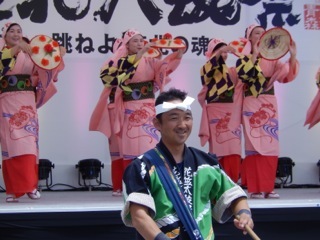 Natori, a town bordering Sendai, blessed with ten years of OISCA support. 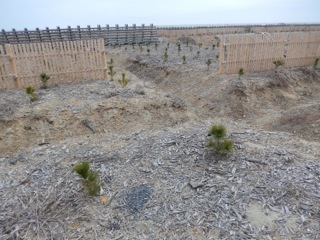 A project to replace large sections of the once vast coastal pine forest, obliterated by the March 11 tsunami. OISCA is wise. It uses the expertise of locals for advice and direction. OISCA supports; it does not dominate. Together all involved build a future based on trust, respect, ancient wisdom, modern science, and hope. OISCA is smart. It works beyond and around the planting of trees. Total commitment to the whole. 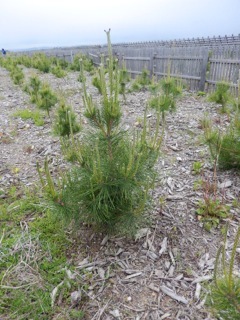 Once yearly, average citizens come to help plant pines. Year round OISCA and locals hold meetings, seminars, and educational programs, both in town and in the field. Experts provide clear explanations of where we have been, where we are going. 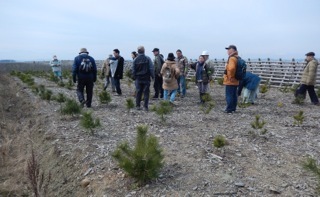 Last weekend OISCA took a group if us to the coast to check on “our” trees, last year’s and the year before’s. We saw how each year a new level of branches shoots outward, the most recent stretching upward, delighting in life, hoping to embrace the sky. We stumbled our way over soft earth, covered with wood chips, and trenches to catch life-giving water, much needed this year of minimal snow and rain. We learned how crucial caring for the roots is, and how red pines and black have different needs. It is obvious that OISCA and those working with them are professionals, people who love the land and who know best how to care for it. Their nurturance blends the expertise of science and farming with the tenderness of devoted parental care. The results are abundant life and a survival rate of over 99%. 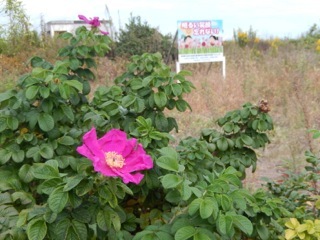 In stark contrast were adjacent patches, planted by a profit-oriented company. The trees there looked sad and weak, dwarfs next to their neighbors, although planted at the same time. OISCA and all those who assist use Science in total accord with the Nature it serves. 100 years from now, 200 (? ), 1000 (?) . . . We are planting today so the future, which we personally will never see, will prosper. Click here to find out where you can purchase your copy locally. This book is a collection of heart-warming letters, but be warned, they may bring a tear to your eye. It's important for this piece of work to spread worldwide. Please help us in doing so. You can find tools and resources and press contacts on our site.